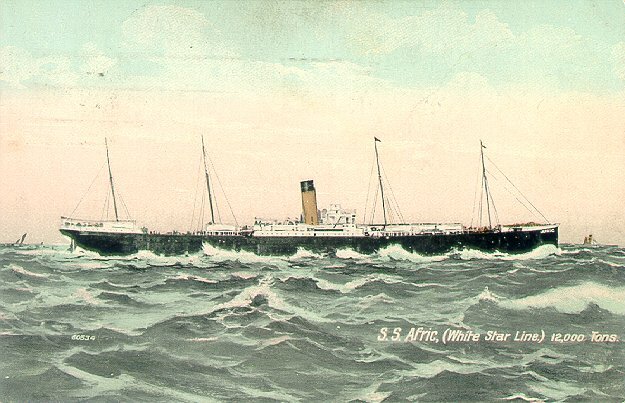 The first of the five "Jubilee Class" ships designed for White Star's Australia service, Afric was launched at Harland & Wolff, Belfast, in 1898, and made her maiden voyage from Liverpool to New York on 8 February 1899. She was then returned to Belfast for some modifications, and entered the Australia service on 9 September 1899. Except for one more New York voyage in August 1900, Afric remained on the Liverpool-Cape Town-Sydney route during her entire career. During the Boer War she doubled as a troop carrier on the Liverpool-Cape Town leg, and she was requisitioned by the Australian government during World War I. On 2 February 1917, Afric was torpedoed and sunk by UC-66 in the English Channel, 12 miles off Eddystone Light en route to Sydney. Although there were 145 survivors, five died in the initial explosion and seventeen others drowned. Afric was one of only five Australian-requisitioned transports to be lost during the War. Sources: Official History of Australia in the War of 1914-1918; Lloyd's War Losses; British Admiralty's Merchant Shipping (Losses); The New York Times, 14 February 1917;Haws' Merchant Fleets; Kludas' Great Passenger Ships of the World; Anderson's White Star.